Part of the magic of childhood is taking part in fun holiday activities. These small moments will create memories a child will look back on for years to come. There are many recipes out there for foaming dough, also called erupting dough. These recipes use everything from shaving cream to baking soda. The least expensive and simplest recipe calls for items you likely already have in your home. Combine one cup of baking soda with one tablespoon of salt. If you would like colored "dough," this is the time to add food coloring. However, this can create more of a mess while your child is playing, so you may want to leave the dough white. Add one-half teaspoon of dish soap and mix thoroughly. The dough will be in chunks. 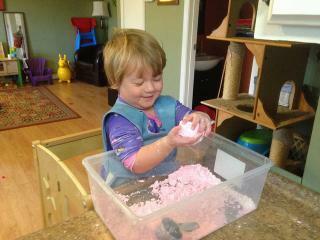 Add four tablespoons of water and use your hands to mix the dough until it forms into a ball. It should be the consistency of bread dough. Your child can now use the dough to form any shape desired. Although it works really well for a snowman because the dough is white, the only limit is your child's imagination. Once the figure is sculpted, add accessories such as a top hat for a snow man or small beads for a Christmas tree's decorations. When your child is ready for the item to melt, simply have her pour vinegar on the figure. 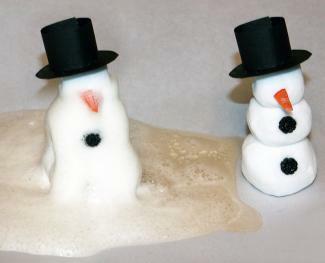 It will start to foam and melt away. Repeat as often as your child wants. Create beautiful mock stained glass with a few simple items. Cut sheets of wax paper and have your child choose one and fold it in half. This will form a crease that serves as a guide. Have the child open the piece of wax paper back up and give him crayons and a small, cheap pencil sharpener. The child should sharpen the crayon colors of his choice, allowing the shavings to fall onto the wax paper. Let the child create his own design. When he is finished adding shavings, refold the paper. An adult should carefully carry the folded paper to an ironing board, cover the wax paper with a towel and place the iron on it for a few seconds. Check to see if the crayons are melted. Once the crayon shavings are melted and the paper has cooled, give it back to the child to cut out hearts or other shapes. You can trace them on first, if your child is a young preschooler. Punch a hole in the top of the heart (a hole punch works well) and hang from the window with a piece of string or fishing line. 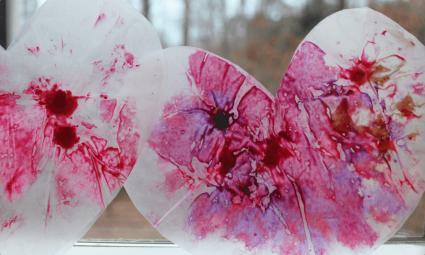 When the sun hits the wax paper, it will create a stained glass effect. Simple, inexpensive and pretty. 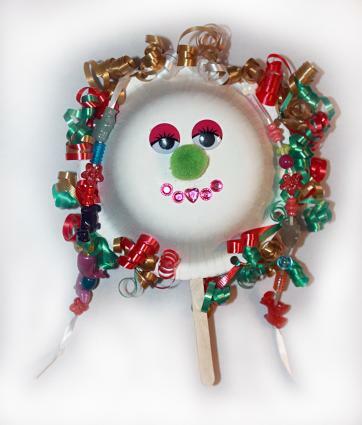 Your preschooler will have fun making this simple noisemaker. While she may not be able to stay up until midnight to ring in the new year, she'll have fun until she falls asleep. Have your child lay a paper plate down and pour about one tablespoon of dried beans onto the center of the plate. Glue a popsicle stick to the bottom of the plate. The stick should stick out enough to create a handle for your child to grip. Add glue around the edge of the plate. Take a second plate and put it face down on top of the first plate. Press together to seal the glue bond. This is a good time to add some clamps from potato chip bags or some paper clips to hold the edges together. Once the glue is dry, your child can bling up the plate with ribbon, beads, mock gemstones and glitter. You now have a noisemaker that will rattle but shouldn't drive Mom and Dad crazy. If you're at a loss for how to build special Christmas memories for your child, start with the article Kids' Event Activities for Christmas. You'll find ideas, such as attending an annual showing of the Nutcracker Ballet or visiting Santa Claus for the annual picture. Some other events that make for memory-building traditions include driving around town to look at the Chisitmas lights, visiting the local zoo to see their holiday displays, or hosting a cookie exchange for your kids' classmates. You'll also want to check out Christmas Crafts for Kids for some fun decorations and gifts your child can make on his own or with minimal adult supervision. Teach preschoolers about the concept of thankfulness with Preschool Thanksgiving Activities. Some of the ideas outlined in this LTK article include collecting food for a local food pantry, making place mats and making turkey decorations by tracing the preschooler's hand. Other things that can help young children connect with the idea of Thanksgiving being about gratefulness include taking turns talking about what each person is thankful for and spending some time helping out at a local soup kitchen or visiting a nursing home. While very young children may not completely grasp the overall concept, remember that you're planting seeds that will make them a thankful person in their adult lives. Although decorating Easter eggs is fun and an area where you can get really creative, the article Easter Activities for Kids outlines some unique ideas for crafts that will take the activities a step further. Help your child make beautiful "flowers" from cardboard and colorful cereal or create a cute Easter bunny work of art. You'll also find ideas for celebrations, such as a pinata party or games that can be used at a party or just for fun. Celebrate America's independence with your child by using some of the ideas found in the article 4th of July Games and Activities for Kids. Although the activities are for all ages, the ones that your preschoolers will likely enjoy most include the red, white and blue jelly bean jar and glow tag. Need even more ideas for holiday activities? There are a few sites out there that offer quality ideas that will keep your preschooler entertained. DLTK's sheer size of activity options makes this the go-to resource for activities for any holiday you can imagine. They have printables and coloring pages that you won't find at any other site and for nearly every holiday. In addition to more popular holidays, they also have crafts, games and party ideas for holidays like May Day, Earth Day, President's Day and Father's Day. Interested in celebrating the Chinese New Year? You will find printable coloring pages and posters, memory card games, a paper doll activity and even a few recipes that will give your child a taste of China. This site has a large collection of printables that will keep your preschooler entertained, but also features ideas for crafts, games and recipes for various celebrations. Enchanted Learning offers some preschool-friendly activities for all the major holidays, but also for days like Groundhog Day, President's Day, Martin Luther King, Jr.'s Birthday and Cinco de Mayo. You'll even find some activities themed around April Fool's Day. In addition to simple drawing and coloring sheet, allow your child to pull some harmless pranks such as creating "cup o' worms" made out of chocolate pudding and gummy worms. Each activity focuses on teaching your child important building blocks to prep her for kindergarten. This site offers unique activities that you just won't find anywhere else. It has more crafts for preschoolers than some of the other sites out there. In addition, it is broken down by age level, with a nice collection of activities for preschoolers. Some of the more interesting crafts include potato print cards where you'll help your child make a stamp out of a potato and even some ideas for homemade toys your child can help create. While the site isn't as large as some of the other sites listed here, the quality of the crafts and links out to other crafts are unlike what you'll find anywhere else. A holiday through a young child's eyes is a magical and joyful time. Adding in fun activities just adds to the overall joy of each season and also gives you and your child a special keepsake to hold onto as the child grows into an adult.